With the Syrian government set to commence a military campaign in the south of the country, it is not implausible to envision a scenario where the final confrontation in the south is between the government and the Islamic State-affiliate Jaysh Khalid bin al-Waleed (JKBW). After all, JKBW's territory is blocked from the frontlines with the government-held areas by rebel-held zones, which are at war with JKBW. 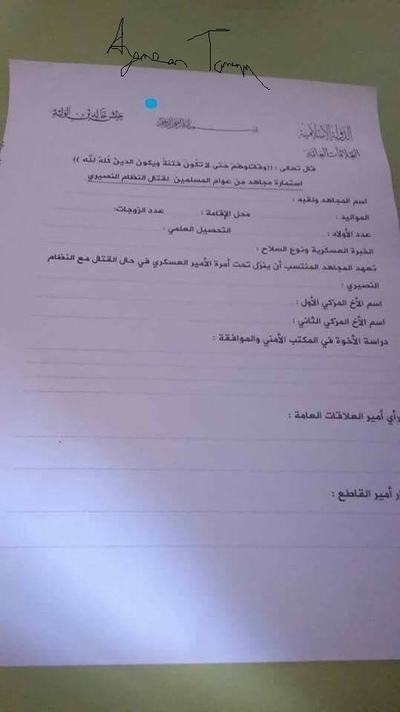 The internal document below is a JKBW recruitment form, officially for the purpose of "fighting the Nusayri regime" (i.e. fighting the Syrian government). As with the previous "Public Relations" document covered on this site and other recent JKBW document specimens, note the Islamic State label on the top of the document. The document is also useful in providing insight into recruitment processes (e.g. requirements of tazkiya- vouching for the recruit- and background checks by the security office). The Almighty has said: "And fight them until there is no more fitna and religion is entirely for God."